The Vinci suborbital space plane's structure and cryogenic fuel and oxidizer tanks are depicted in this illustration. A unique space plane concept has the potential to evolve into a vital space science laboratory for European Space Agency microgravity research at the edge of space, SPACE.com has learned. The new Vinci space plane is detailed in an ESA report obtained exclusively by SPACE.com. The report, titled "A Cryogenic Sub-orbital Spacecraft," says the plane would be a piloted vehicle with the appearance of a business jet and would be propelled by the Vinci rocket engine currently being developed for the upper stage of the European Ariane 5 rocket. The spacecraft would be reusable, unlike the rockets currently used by the ESA for suborbital experiments. It would also be designed to carry eight people — six passengers and a two-person crew — into suborbital space and back. According to its mission description, the Vinci space plane would take off horizontally from a runway to carry scientific payloads into suborbital space. The spacecraft would not reach all the way into orbit for complete trips around the Earth but would achieve an altitude above 62 miles (100 kilometers) and experience several minutes of weightlessness, during which the experiments would be carried out. Using cold gas thrusters to orientate itself for re-entry, the Vinci would then return to its takeoff runway, gliding down to land like a normal aircraft. This graphic of the Vinci space plane Concept 2 highlights the suborbital spacecraft concept vehicle's split vertical tail and canard. A spacecraft like the Vinci is known in the aerospace industry as a "vision vehicle" because it would not necessarily be built; rather it is a generic design that involves all the relevant technologies of an actual single stage to a suborbital space plane. According to a vehicle description in the ESA study, the Vinci concept vehicle would have no jet turbines, only the Vinci rocket engine, which uses liquid hydrogen and liquid oxygen and by design is capable of restarting up to five times. For its fuselage, the Vinci would have two carbon-fiber-reinforced plastic shells separated by a Nomex honeycomb core. It would use the kind of landing gear already in operation on aircraft. In "A Cryogenic Sub-orbital Spacecraft," ESA officials examined three flight concepts for Vinci; they selected the second one for further analysis. 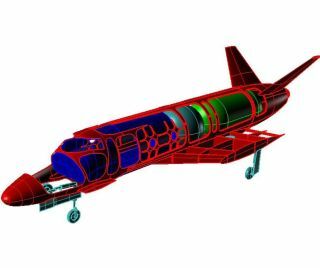 "The final decision was to employ Concept 2 due to its ability to carry a dorsal-mounted payload; the reduced complexity of the tail mounting around the rocket motor; and the provision of additional control surfaces for aerodynamic stability," the report states. The phrase 'additional control surfaces' appears to refer to the canard, a small wing at the aircraft’s nose, that can be moved to aid an aircraft’s control. The Vinci Concept 2 also could have a payload carrier on its back from which microsatellites could be launched into low-Earth orbit. This dorsal payload is possible because Concept 2 has two canted tails instead of a single, vertical tail fin. Under its proposed design, the Vinci Concept 2 would be able to reach an altitude of 66.8 miles (107.65 km) and a peak speed of Mach 3.5 — over three times the speed of sound. Its maximum takeoff weight would be 30,625 pounds (13,920 kilograms), of which 16,534 pounds (7,515 kg) would be fuel, according to the study. Of the other two Vinci concepts, Concept 1 had no canard and called for a conventional tail with a single vertical fin and horizontal stabilizer. Concept 3 had a canard but had winglets instead of a vertical tail and horizontal stabilizer. ESA scientists currently use expendable rockets to send experiments into space, with some launches reaching an altitude of 497 miles (800 km), to take advantage of the weightless environment. Last November, for example, the ESA used an expendable rocket to test launch vehicle subsystem technology for future vehicles. But the space agency is interested in the potential advantages of a reusable space plane system, such as lower costs per flight and a wider variety of payloads. In the United States, NASA has already tapped into new, private suborbital launch vehicles to aid its technology experiments as part of the agency's Flight Opportunities Program. The program is accepting proposals that can fly on Virgin Galactic’s SpaceShipTwo spacecraft — an eight-person private passenger spacecraft for suborbital flight, currently in flight testing — and the reusable vertical takeoff-and-landing Xaero rocket being developed by the California company Masten Space Systems. A two-person Lynx space plane being developed by XCOR Aerospace and suborbital rockets built by several other companies are also part of the program, according to NASA officials. A design drawing of the Vinci suborbital space plane Concept 2 under review by the European Space Agency. This year Xaero is expected to start flying and Virgin Galactic is expected to conduct the first in-flight rocket engine tests with SpaceShipTwo. But ESA can’t use Xaero or SpaceShipTwo because of internal rules that bar the European agency from funding foreign suborbital vehicles operating in foreign countries. The agency's funds have to go to Europeans. In December 2010, ESA conducted a survey of European suborbital spaceflight providers. "It is the first time that Europe embarks in this kind of inquiry," ESA's then-director of human spaceflight, Simonetta Di Pippo, said at the time. "We see this as yet another valuable opportunity to expand the scientific endeavors in space and to promote future exploration missions." That 2010 survey concluded that in Europe efforts were still at an early phase of development. There was no appropriate service ESA could use for its own version of a Flight Opportunities program. Because of this, ESA started considering funding generic technologies to encourage European suborbital vehicle development. Since ESA is required to fund pre-competitive technologies, a methane/liquid oxygen rocket engine has been ruled out because it is to be used in the space plane already proposed by the aerospace company EADS Astrium. Astrium’s concept also looks like a business jet with a canard, and has two turbine jet engines as well as the rocket engine. The project, announced in 2007, has been moving forward slowly due to a lack of development funds. In January 2011, however, Astrium announced it had begun working with the Singapore government on the project.